Haleswood is a family run business based between Telford and Shrewsbury and run by Heather and her two daughters Holly and Niamh. We are fully licensed by Telford & Wrekin Council and fully insured. We have separate areas for each pet boarding with us to ensure a peaceful environment. Kennels- we have 20 heated kennels with external covered runs and separate exercise areas where all dogs are provided with 1:1 care and attention. 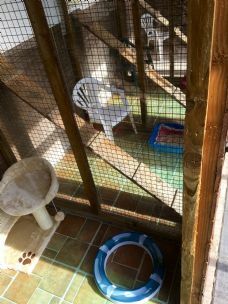 Cattery- we have 16 penthouse suites with external covered runs and private sleeping areas containing hiding places for your cat. Scratch posts are provided as well as cat toys and games to keep them occupied. They have views of the well stocked gardens where they can watch the wildlife and everyday life. All dogs are exercised at least four times a day and are provided with plenty of toys and balls etc to wear off their energy! Cats have cat trees and several different levels available to them for variation along with enriching toys, scratch posts etc. We ensure high hygiene practices are followed and have robust policies and procedures to ensure your pet's safety and wellbeing whilst they stay with us. All medication will be signed in and stored securely and administered at correct intervals as per owner and vet instructions. We provide a taxi service within 5 miles of Haleswood. Doggy day care is offered, please enquire for more details!